These sandbags have a patented interlocked stacking design that allows better strength and stability when stacked. They are designed for stability when stacked as a barrier wall so water can be held back or channelled away more effectively in flood situations. They are designed to be used in pairs which can be built up as a wall or barrier brick style. 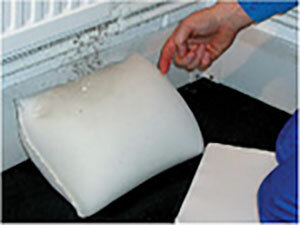 There are certain occasions in which a single sandbag level or a small stack of sandbags is not enough to keep water away from your property or to channel it effectively. Relying once again on piled sandbags is not the solution either as they are heavy, dirty and they are difficult to stack. This is why we developed Absorbeez Stacka Sacks. The design gives increased stability, which allows them to act as a highly efficient flood barrier to hold back and channel water in flood situations. The Stacka Sacks are stitched into three separate panels with an overall bag size of 1000 x 300 mm. The panels are filled to absorb different quantities, giving a corrugated effect when activated. That’s how Stacka Sacks fit more securely with one sack locking onto the next, giving maximum stability with no slip. Absolutely user friendly, they are sold in pairs: one is coloured black and one white to allow for fast and easy stacking. These bags measure 1,000 mm x 300 mm and each pair can absorb 28 litres of water. 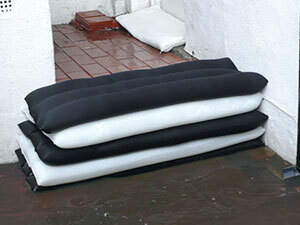 The ideal leak intervention and flood protection product … but it’s not a sandbag!